Kiss a frog and fall in love, with Cricket. 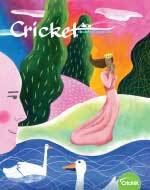 • Plus, a Cricket Country cartoon, a crazy Crossbird puzzle, and a new poetry contest about a magic spell. Shazaam!